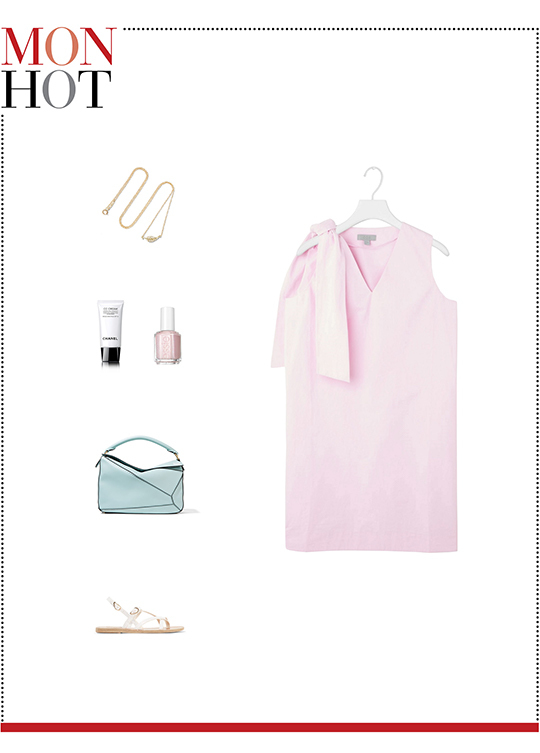 A sleeveless knotted shoulder dress from COS. See how you can coordinate your wardrobe in 5 different ways with 1 item, under $100. 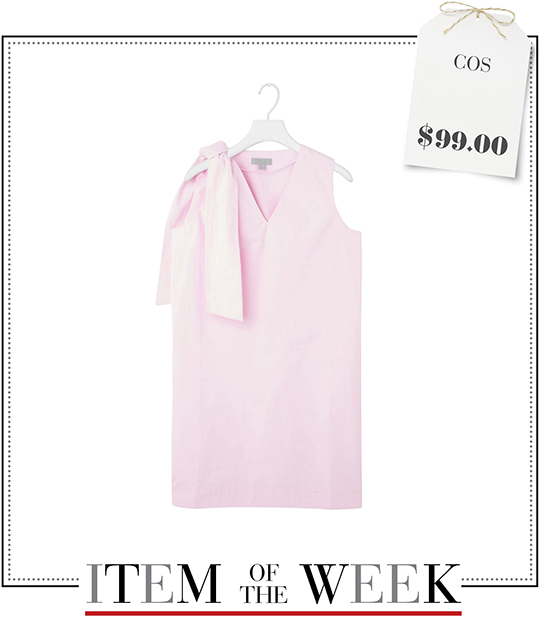 Monday Hot: Colorful and breezy, COS's pink shoulder-knotted dress is the ultimate cool city piece. Stay chic in the heat by teaming this lightweight cotton frock with these super hot accessories: a mini leaf pendant necklace, a sky blue leather bag, white strap sandals, sun-blocking CC cream, and glittery nail polish. 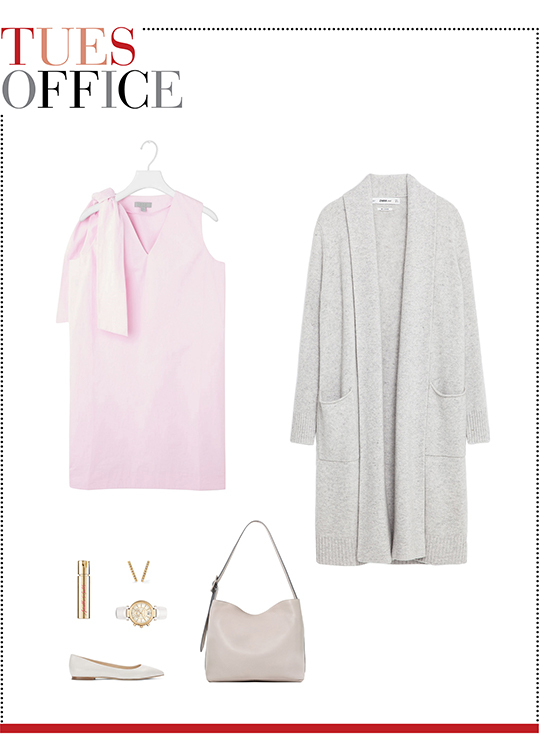 Tuesday Office-friendly: Minimum effort, maximum style can be accomplished with this week's pink V-neck dress and an open-front cashmere cardigan. Add to this look a light gray shoulder bag and a pair of pointy flats to inject a dose of elegance to your office look. Finish with diamond stud earrings, a white chronograph watch, and some rosy pink lip stain. Wednesday Rainy: Did someone say rain? Make a fashion statement in any downpour with today's playfully stylish rainy day outfit. 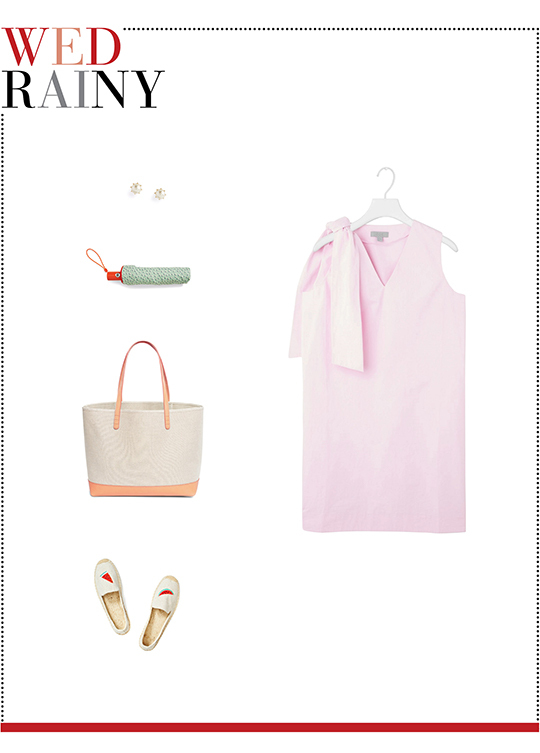 Try teaming up COS's pink knotted shoulder dress with a pair of faux pearl stud earrings, a large canvas tote, and watermelon-embroidered espadrilles. Don't forget to grab a printed umbrella on your way out. Thursday Date Night: Perfectly polished with a touch of evening glamour, here's how you can build an ensemble appropriate for dinner and drinks. 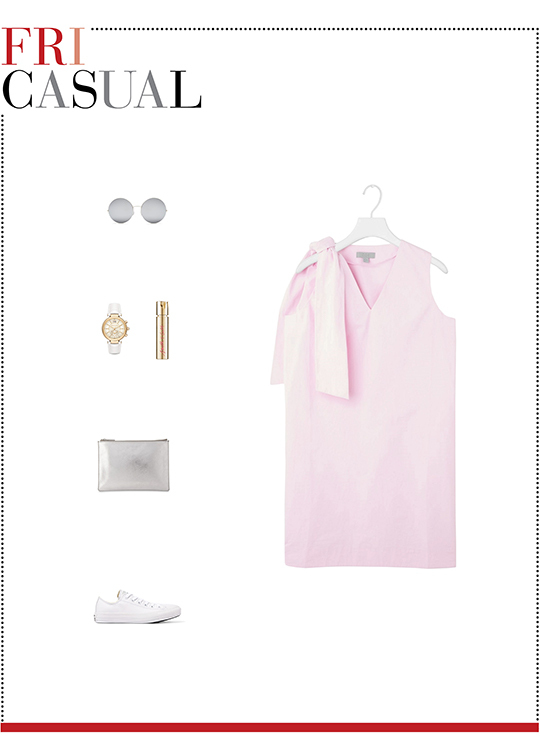 First, slip on this week's sleeveless pink dress and match it with a pair of metallic sandals. Next, accessorize with simple and delicate details such as a mini beaded bag, a pearl cuff, and pearl drop earrings. Friday Casual: Meet the new off-duty essentials you'll have on rotation all season long. Wear a pair of round frame sunglasses, a silver zip clutch, a pair of white sneakers, and Tuesday's chronograph watch and lip stain to create an attire thats relaxing and refreshing.